Long time no field report. In the past few months, there has been a lot of progress and change. 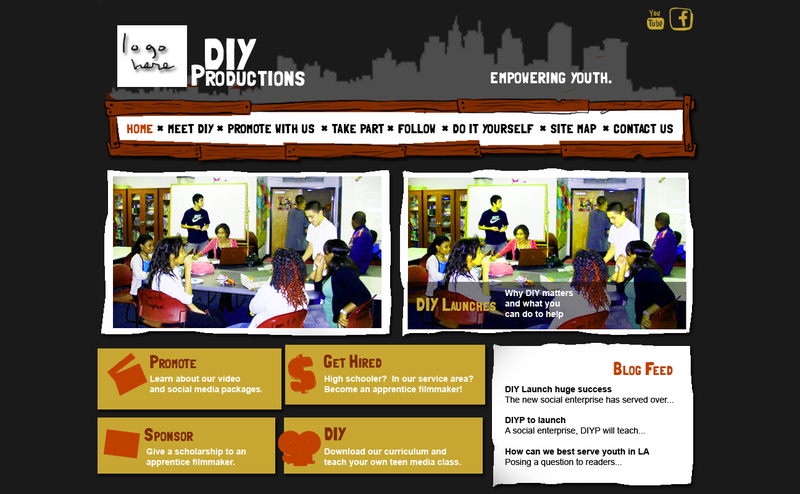 Tiffany is our new and awesome VISTA, and with her added support, DIY Media (a program to train youth in documentary filmmaking, social media, etc) has launched. I've been working with her and staff to develop the curriculum for this project. I think it would be worth it as well! FYI I posted your promo video and the web design mock-up on the Transmission Project's resources page. Josefina Luna is one of the kindest, warmest, friendliest women I've ever met. We started talking one day when we were both waiting to be let into the office, before I was given my own key. She speaks fragmented English, but it's a thousand times better than my broken Spanish. Nice rework of the site. The new layout feels a lot more intuitive. Views is probably the most useful module I've found. It's incredible but can be daunting to try to use off the bat. I've got to learn how to use Panels. Any good tips for someone unfamiliar with it? Hope everything's going great over in San Fran. Hmm. 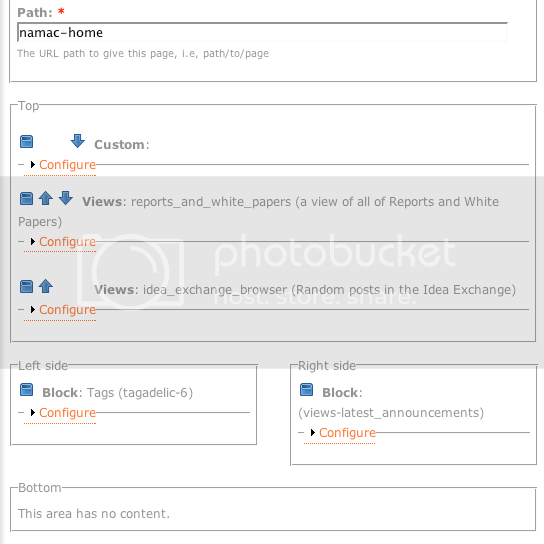 With Panels, it's really helpful for layout of a site. 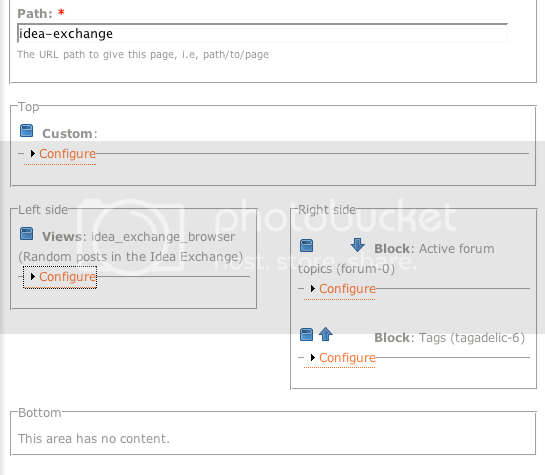 It's nice for working with blocks (which as you know, are pretty limited on where they can be placed on the Drupal page). What's superpowerful though is when you combine the Views modules ability to render content in a block and feed that is as a 'block' on a panel. Use a custom View - the same one in fact - the View (rendered as a block) brings up 10 random posts of the 'Article' content type as a list. This is the 'Articles From Our Members section' you see on each page, though on the front page I limited I to 5. I included the screenshots from the admin interface so you can compare. Note that each is a 'two column stacked' style of panel, meaning one section at the top and one section at the bottom of two columns side by side. Hope these make sense. Hit me up if you wanna play with them anymore. Does Ben use Views or Panels on this site? I'd love to see the module list. Sorry to hear about your horse. Maybe you could post some pictures? ps. http://www.freecycle.org is a good resource to find free stuff (like bales of hay perhaps). "All that is possible is seeking expression though human beings." I know a lot of u are tired of reading all of my posts since I do em so often (every 3months-lol) but here I am. Since last time I've gotten a much better handle on web site building though I still have much to learn. I finished the company site a few weeks ago and are just waiting for the go-ahead to publish it to the web. How did the strategic planning process play out? We're gearing up to do some new strategic planning at CTC VISTA HQ and I'd be interested to know who you were working with and what process/tools you used. Our favorite is SWOT Analyis (Strengths-Weaknesses-Opportunities-Threats). I'm looking forward to seeing the new website. What did you build it with? Learn anything interesting: technically or in the process of design and approval? The planning process went about as smooth as can be expected. We're aiming to work with as many local organizations with community involvement as possible. I've gone to a few community workshops sponsored by "Capacity Builders" and collected a lot of business cards. The basis of the website was Microsoft Frontpage (after giving up on Dreamweaver-lol). The Kiosk was started with Frontpage but finished in a lesser know program called Web Easy. I was trying to find the absolute easiest program to train new students with. As far as the learning, that's an ongoing process. Web design is a whole other art form that takes a lot of time an effort to learn it's true foundation. What kinds of process did you go through to do the strategic planning? Any useful tools or methods? As Ben said over here at project HQ we're going to start the planning process again soon. My man Mike. Don't embarrass your VISTA Leader with all this posting! But seriously, document the process! there's quite a few new VISTAs doing the same thing you're trying to do, just 5 months behind ya! ps I'll call ya soon...and tell Ramon he's on my blog/field report hit list. Screenings, Workshops, Tutorials, oh my! Time for a quick summer update. Mmmmm summer...it's a good thing! do you know what is expected of you at any one point in the year? have you gotten forms off the website? have you gotten manuals or guidelines off of the website? do you read blogs or the newsletter (the Digest) off of the website? do you read the vista blog? do you use the wiki? Project: Develop Strategic Plan for HOME, Inc. Result: A strategic foundation that includes well-defined programming, meta-structuring of how all HOME, Inc. related programs converge, detailing of company roles, an updated organizational mission, etc. Hello everyone! Time for an update. I've been way way busy lately (I'm sure you all know how that feels). We just finished a weeklong workshop with middle schoolers at the Marin Youth Center's Computer Clubhouse. It was my first time in a computer clubhouse, they seem like a great idea! While I was there I learned a little about making beats using FruityLoops. Fun! But a lot harder than I thought it would be. Thanks for that great link! We've been having problems too. Seems like most electronics have legs and walk off. I'll definitely be using this. A coworker just suggested I turn this into a one-day workshop for kids. Maybe even go to some electronics store and ask them to donate some flash drives even. This project has got a cooool factor to it. Collins Center for Public Policy, Inc. I have been given the task to increase the viewership and participation in www.sflregionalequity.org (a website dedicated to achieving greater equity in the Southeast Florida region through promoting and enabling affordable housing, transit-oriented development, stronger neighborhoods, and equal access to education and health). I believe in the cause and I think demand for the website is out there. However, I did not know how to best get the word out. At first I spent approximately 60 hours identifying 1800 possible organizations and local activists who would possibly be interested in the purpose of the site. I then went ahead and emailed and snail mailed invitations to the website with very little response. I believe that of the 1800 pieces of mailings I received 2 phone calls and 7 emails. So that tactic did not get the results I was hoping for. The only way to "sell" a website is on its content. I think that one of the most effective ways to get people using a website is to use it to answer their questions. I don't know what sort of org you work at or how much networking you do (by email, in person, at conferences, at community tech trainings), but if you know the content of the website, you can bring up ideas from it in conversations and add, "I'll email you a link." if they're interested. If people pass bits and pieces of a website on to their coworkers or people they work with, it's not only "selling" the website, it's people actually making use of the content (which is [hopefully] the real point behind getting the word out). If you're trying to spread the word about a website, "inreach" can be as important as outreach... do people in your organization use the website? If people within the organization are reading the website and casually passing links on to colleagues (the way links show up here on this blog and in our wiki, though most people would do that via email), or if they are using articles to introduce outsiders to their work, it shows a real ownership of the content. People will be much more willing to check out a website that is directly related to something specific that they're doing/thinking about/talking about. And if people within your organization aren't sold on the site... how are outsiders supposed to be sold on it? uh, what I mean by that is, find the good parts and pass them on. Maybe that's too much person-to-person interaction/work... but content and people are the most important things, and have to be in it somewhere. HTH. Those are some good thoughts! I suppose why this has been so challenging is because I have no real experience in urban planning (the content of the website) and in marketing. I guess what I should do is focus on getting the word out while at the same time collect useful information, put it on the website, and educate myself on the issues at hand. That way I could actually conduct a conversation about it when out in public, which would reinforce the marketing of the site overall. Its coming together slowly but surely. Almost everyone likes a good human interest story. Your NP is certainly a good fit. That would also be high profile. Use low / no cost outlets. Hi Mike - I really like your ideas here. You should add them to the VISTA wiki! Posted to the Wiki as well. "Nonprofit Internet Strategies - Best Practices for Marketing, Communications and Fundraising"
Youve made some pretty good suggestions! The conference I was at yesterday made some of the very same points that youve made. There will have to be another blog topic on social networking using web 2.0 methods. Also, people may not know the resources you offer. Maybe try a targeted marketing campaign (that's a marketing class term). Contact the affordable housing orgs and let them know what's available. And do the same with the other "targets" or "niches"
Last year I worked at an affordable housing org too. People just didn't know that there was usable info and stats and help and all that available. I'd also suggest to try and get write ups about the site in other organization's newsletters. It may be small fries, but it's a spreading the word campaign.